BACKGROUND: U.S. Latinos experience high rates of cardio-metabolic diseases and have high rates of physical inactivity and sedentary behavior. Understanding the environmental factors associated with physical activity and sedentary behaviors among Latinos could inform future interventions. 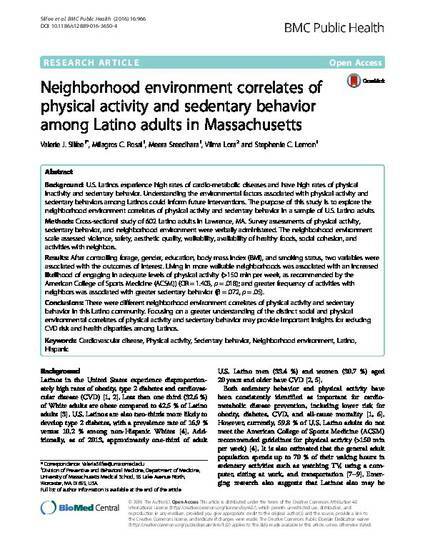 The purpose of this study is to explore the neighborhood environment correlates of physical activity and sedentary behavior in a sample of U.S. Latino adults. METHODS: Cross-sectional study of 602 Latino adults in Lawrence, MA. Survey assessments of physical activity, sedentary behavior, and neighborhood environment were verbally administered. The neighborhood environment scale assessed violence, safety, aesthetic quality, walkability, availability of healthy foods, social cohesion, and activities with neighbors. RESULTS: After controlling forage, gender, education, body mass index (BMI), and smoking status, two variables were associated with the outcomes of interest. Living in more walkable neighborhoods was associated with an increased likelihood of engaging in adequate levels of physical activity ( > 150 min per week, as recommended by the American College of Sports Medicine (ACSM)) (OR = 1.403, p = .018); and greater frequency of activities with neighbors was associated with greater sedentary behavior (beta = .072, p = .05). CONCLUSIONS: There were different neighborhood environment correlates of physical activity and sedentary behavior in this Latino community. Focusing on a greater understanding of the distinct social and physical environmental correlates of physical activity and sedentary behavior may provide important insights for reducing CVD risk and health disparities among Latinos.